New Sun Yu Enterprise Co., Ltd. has been regarded as leading manufacturer in Metal Casino Slot Cabinet business of Taiwan. New Sun Yu was 120% dedicated in the market of precision metal sheet processing, state-of-art Laser Incision technology practice and ingenious expertise in high-end Metal Casino Slot Cabinet assembling since 1990. New Sun Yu is not only able to manufacture OEM/ODM demand, but also provide extensive R&D professional service for Metal Casino Slot Cabinet that remains our top priority of all time. NEW SUN YU website for amusement machine.video cabinet. roulette machine.spare parts.kiosk machine, kiddie ride etc products. For our more detail products, you can check our websites. 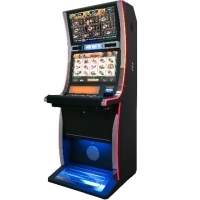 MCFM-54 32"vertical gaming slot machine Custom gaming slot cabinet design and manufacturing. The latest technology and the hottest design trends to grab gamers. Designed and built in Taiwan.